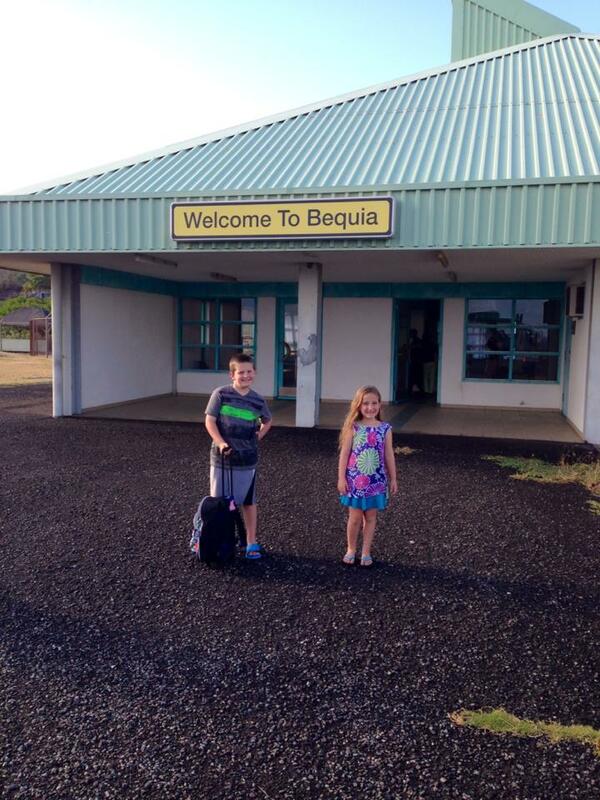 We have traveled to many different islands and countries off the beaten path with our two children. I should have been more prepared. Yet, when we arrived in Bequia, a little piece of paradise, I had an uncomfortable unsettled feeling in my gut. We walked from our small, 16 seat airplane, into the airport, which is about the size of a living room. It takes time to reconcile the expectations I have of an acceptable standard of living to what I see around me. For the most part, in the US, children are supervised, buildings that are crumbling are condemned, and roads are wide enough for two cars to pass. I had to just let go of my expectations and take a deep breath of the warm, salty, island air. The man who was the caretaker of the house we rented picked us up at the airport. He was at least 6″5′ with a big friendly smile. He drove us and our luggage through the narrow, bumpy pothole filled roads to the beautiful villa. It was a steep drive up the road and a steep climb up to the house, but the view took my breath away. From the deck we could see the harbor below with all the sailboats and also St. Vincent Island across the Caribbean Ocean. We spent our days scuba diving, snorkeling with the kids, reading on the porch, and playing in the plunge pool. While my husband was diving I spent hours sitting talking to local women near the dock while the kids swam and played in the water. The most beautiful people shared about their lives with me. Every Bequia native I met has had family on the island for three or four generations. The stories they told about life on Bequia are like gems I collected. One special lady was my favorite. She worked in the ice cream shop near the dive shop and would sit outside with me and watch my kids swim. Besides ice cream, we also bought homemade yogurt and local honey from her. Fresh produce we purchased from a small stand in Port Elizabeth. We picked mangos from the tree outside the house. I was surprised to find that Curry is a popular ingredient on the island, along with Callaloo (a popular dish in the Caribbean, originating from West Africa, that is made of leafy greens). Our family rule is that everyone tries everything. I was so proud of my kids, tasting new flavors that will broaden their palates forever. Every fish, fruit, and vegetable we ate tasted delicious, like it was in its purest, freshest form. On Monday we met up with a beautiful third generation woman of Bequia, at her local shop. 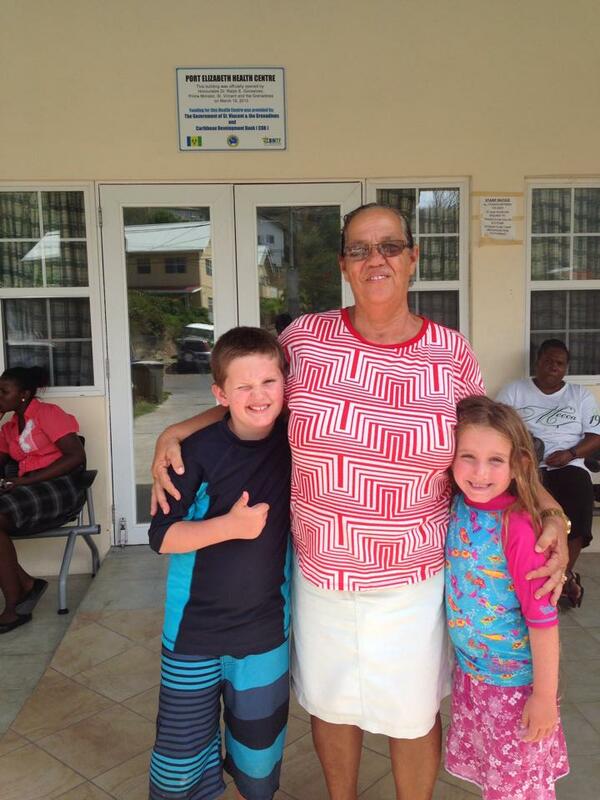 She was expecting us because I had emailed the Bequia Mission asking what supplies our family might bring to donate. She greeted us with warm smiles and suggested we go together to the primary school and the medical clinic to deliver the items we brought. We had packed one of our large scuba bags full of school supplies, children’s books, bandages, cotton swaps, wrist and finger stints, medical tape, and accessories for crutches. Sadly I realized with a sinking heart, as we walked into the one building schoolhouse with our bags, it wasn’t enough. Their need was so great, it was overwhelming. The school master was gracious and kind. She assured us the things we brought would make a difference to the children. As we were leaving our kids saw the playground. It was a 100ft by 20ft dirt yard. At the same time we heard the children’s voices chatting and laughing from inside the school. My son looked at me and held my gaze. His look told me he grasped the joy he heard in a place that by our standards was lacking so much. I believe my children are learning the power and necessity of giving. This is the greatest gift we can give them. When we walked into the medical clinic there was a gurney by the entrance that you and I would not have allowed our own loved one to be placed on. But then again, a gurney that would not meet OSHA standards is better than no gurney at all? The smell of disinfectant filled the air. The lady who ran the clinic wore a crisp white skirt and blouse with a matching cap. I could tell that running the clinic was her labor of love. Day after day attending to the many needs of her people with few supplies is evidence of her heart. She graciously received the medical supplies and engaged my kids in conversation. Our kids witnessed a truly selfless woman following through with her calling to serve, and using her life saving gifts for the love of others. At the end of our visit I’m brought back to my initial question, “Do we belong here?” I suppose the real question is, “Am I willing to be outside my comfort zone?” We bring our children to different places in the world so they learn about another culture and way of life. Because of what they have seen and experienced, they will grow into compassionate, educated, and motivated human beings. Truthfully, my kids are quite comfortable outside my comfort zone. They are so open and adaptable because they are still growing. I’m the one who experiences real change. My eyes are open and my heart too. We belong here! Our being here provided work for the man who took care of the house we rented, his sister who cleans the house, the couple that runs the dive shop, the dive masters, and the boat captain, etc. All of the restaurants we’ve frequented and food and gifts we’ve bought support the economy. Bringing desperately needed supplies for the primary school and the medical clinic felt like it hardly made a dent in the great need we saw. But a dent is better than no dent. Many people will have bandages and other necessities for their injuries. Children have pens, pencils, and new books to read. We’ve had the opportunity to contribute a little to this amazing Island. The blessings we have received are great. The diving here is majestic and allowed us a peek into the underwater world we find fascinating. We have been able to retreat and find peace for our souls in the stillness and slow pace of the Island. We’ve enjoyed fresh fish in town and mangos from the tree in our yard. But most importantly our children’s eyes are open and aware of the people of Bequia, their smiles, their kindness, their kisses, their poverty, and their many needs.